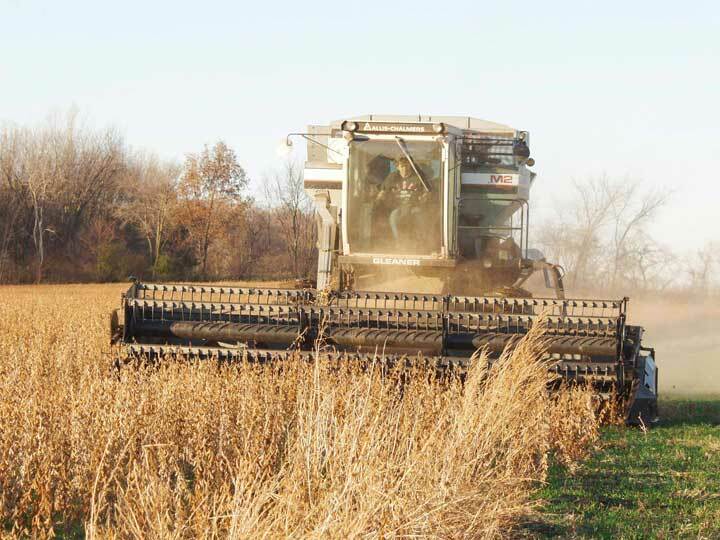 Soybean Harvest: Around October the soybeans are ready for harvest. They have to be dry, otherwise drying in the bin will be needed to prevent spoilage. 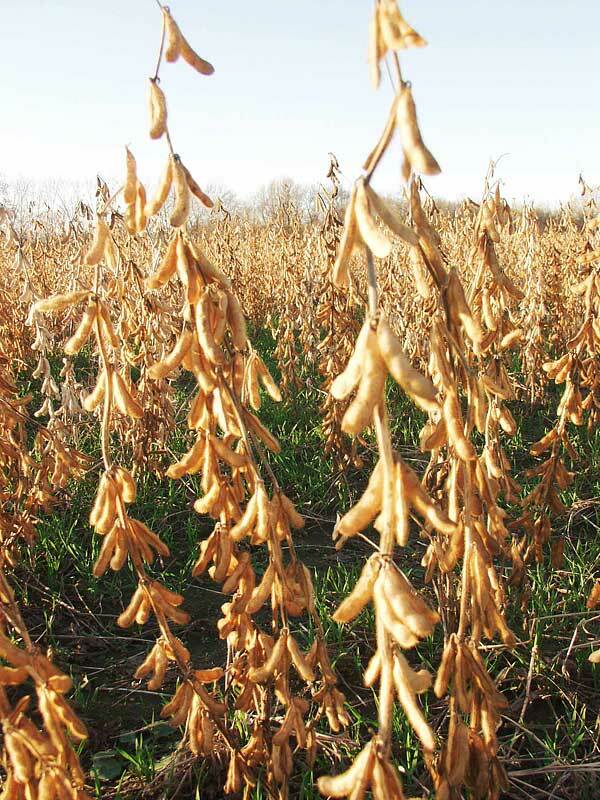 Here is a picture of soybeans ready to harvest, the green of the growing season has turned to brown. Notice the green on the ground underneath the soybeans. This is winter wheat which was planted with an airplane! The wheat seeds fell through the soybean canopy and landed on the ground just before the soybean leaves were ready to drop off the plants. 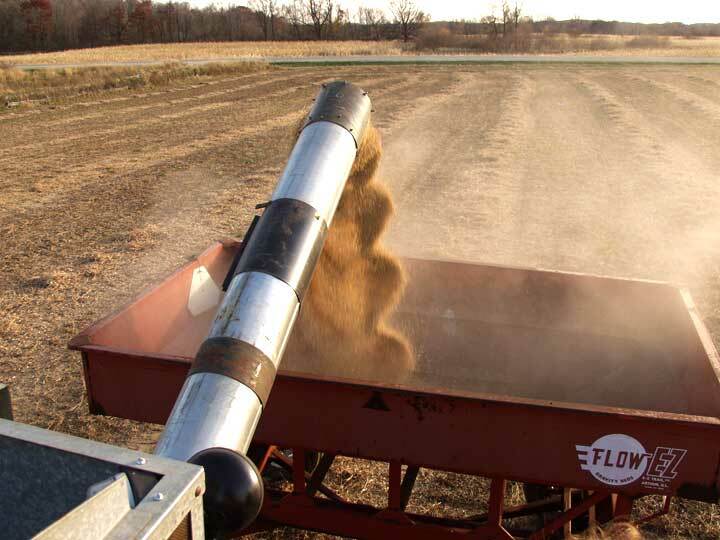 Shortly, the leaves dropped to the ground onto the wheat seeds and helped to germinate the wheat. 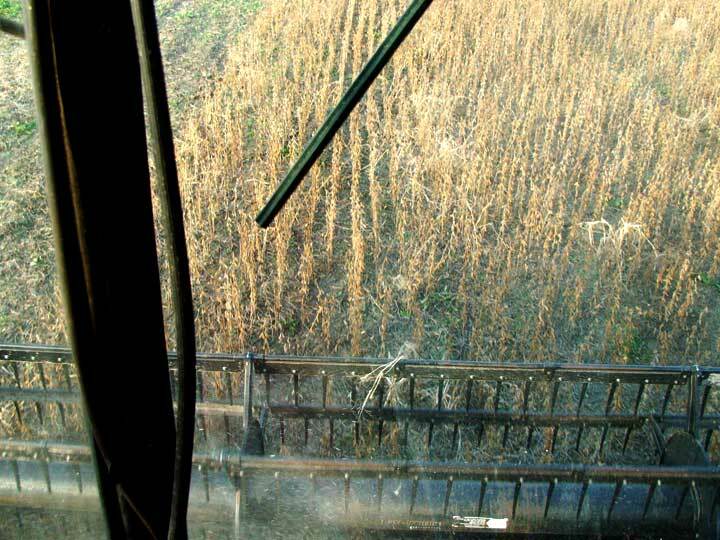 This picture of the soybeans was taken just a few weeks after 9/11. The fall of the Twin Towers meant that all aircraft was grounded for several days, including the plane that was used to plant our wheat. The planting had to wait until planes got the "All Clear". A longer view of the field. 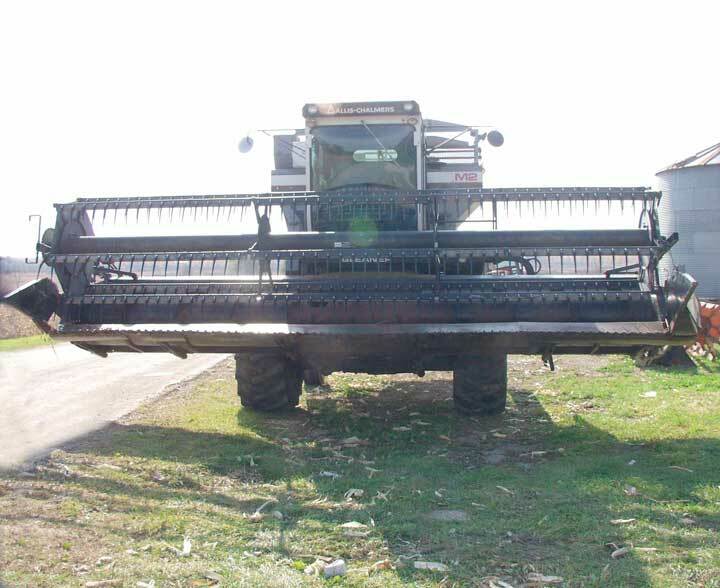 Here's a front view of the combine with a flexible head, so it can ride over contoured ground. No matter the head we use, combining is always noisy and dusty, but it is especially dusty combining soybeans! Carl is driving the combine here. The word combining came about because the machine combines cutting, threshing, and cleaning all in one machine. Pretty neat word, Our combine is very fuel efficient and very easy to work on. You can see the dust trailing behind the machine. 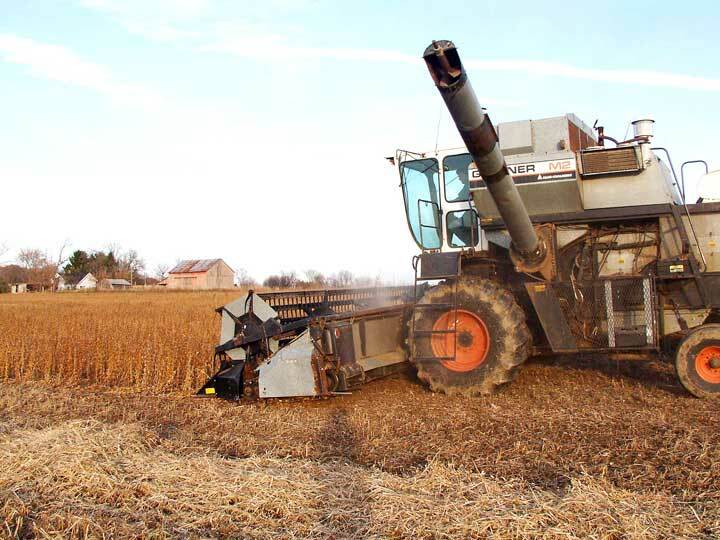 The soybeans are pulled into the combine with the big roller with teeth. The stalks go one way and the beans go another. The straw is kicked out behind and the beans go into a container behind the driver. Above, you see what Carl sees from inside the cab. Notice the green of the wheat growing underneath. 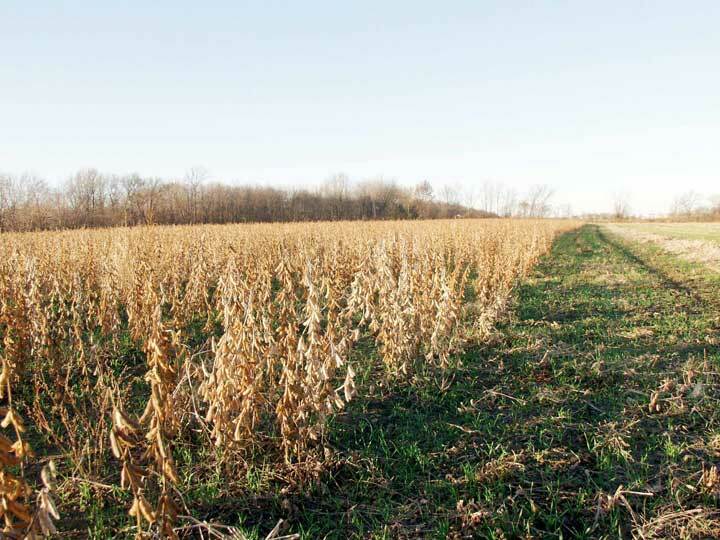 The growing of wheat after soybeans can be done with a No-Till planter after harvest, eliminating the need for an airplane to seed. The combine has an auger, the bin on the combine can only hold so much before it needs to be emptied. The auger swings out so it can dump in the wagon, then when done, it moves close to the combine, like your arm next to your body. Another view of the auger out in the dump position. A wagon or a truck can pull up beside the combine. The soybean straw lies in rows, and if we have time and the weather cooperates, we use the baler and make bales. The bales are very useful in the garden for mulch. 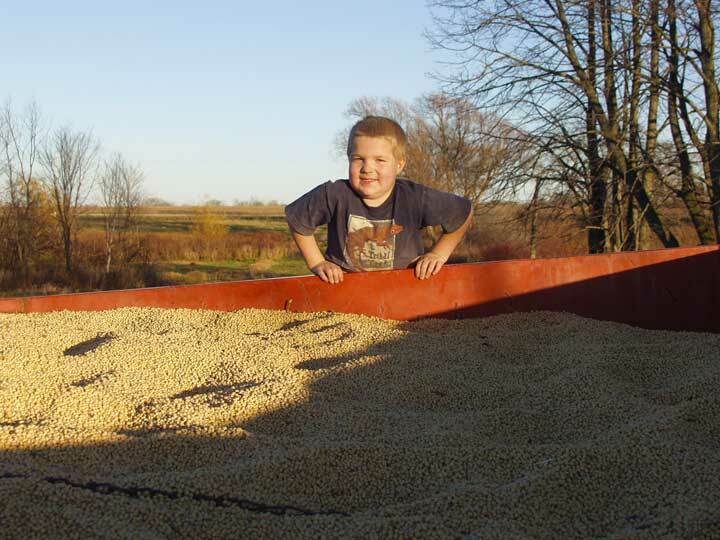 Our nephew, Charlie, is inspecting the full wagon of soybeans. Above, dried soybeans in a bowl. 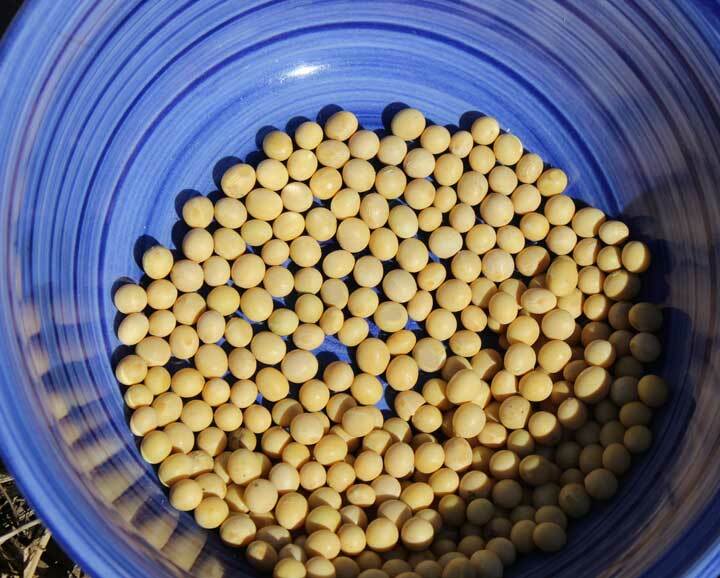 Students, do you know what we do with those soybeans? That's right, we package it and people make soymilk or tofu at home. We have smaller packages but this shows a fifty pound bag. That would make lots of soymilk! What do we do in the winter? We continually check the moisture and temperature of the popcorn in the drying bins. 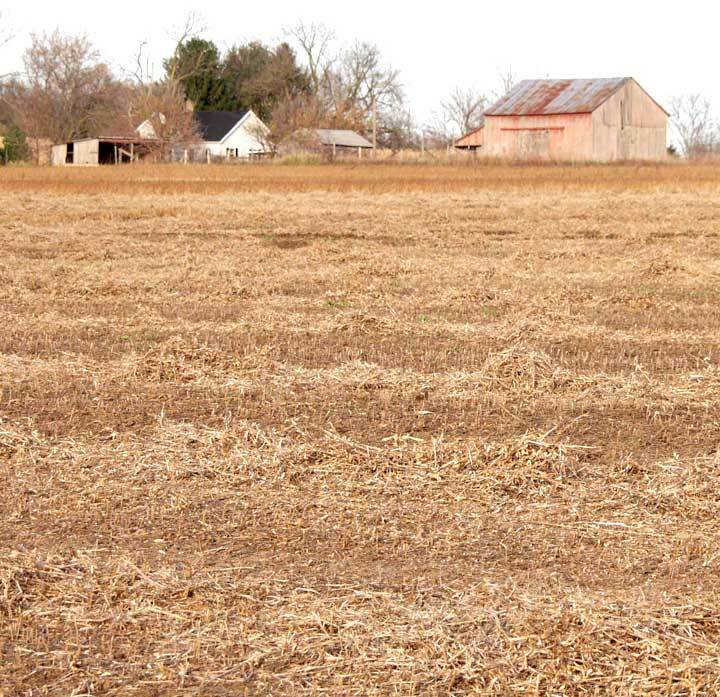 In late fall, early winter, before the ground freezes hard we prepare some fields by using a chisel plow which breaks up the soil and leaves ridges but does not cover all of the trash from harvest. This is done to protect the soil from erosion. 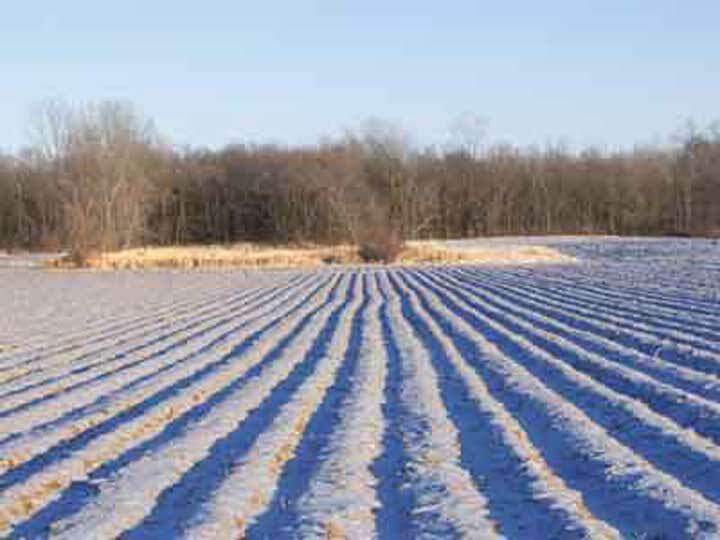 The chisel plowed field below has a light covering of snow. There are always repairs and upgrades needed for the tractors, trucks and other equipment like the forklifts. We have to move the dried popcorn to the holding bins using pneumatic transfer equipment. This blows the popcorn in a pipe into the holding bin. The popcorn stays clean and the kernels are not damaged. From the holding bins we transfer to the tumbler in batches as needed so that we can clean and package the popcorn. We evaluate what stock we have and what we should grow next spring. Cleaning and packaging popcorn: Once the popcorn is the proper moisture where it will pop and not be too dry or too wet, around 13.5%, we process it in batches. What are bee's wings? The tumbler has baffles inside. We call it the tumbler because when it turns, it causes the kernels of popcorn to bump against each other, like bumper cars. When they do, they knock each other's little wings off. We call them "bees wings", they are tough little bits that you don't need to eat when you pop your popcorn. However, they protect the germ during pollination, so they do have a function. If you put that kernel into the ground, the germ is where the plant starts to grow, a black speck at the tip of the kernel you don't see. The bees wing protects that spot. The rest of the kernel is a carbohydrate food source for the plant to grow from. It does not need fertilzer at this point. Not until the plant is out of the ground and setting small leaves, then it needs fertilizer. So what you are eating when you eat popcorn is baby plant food! 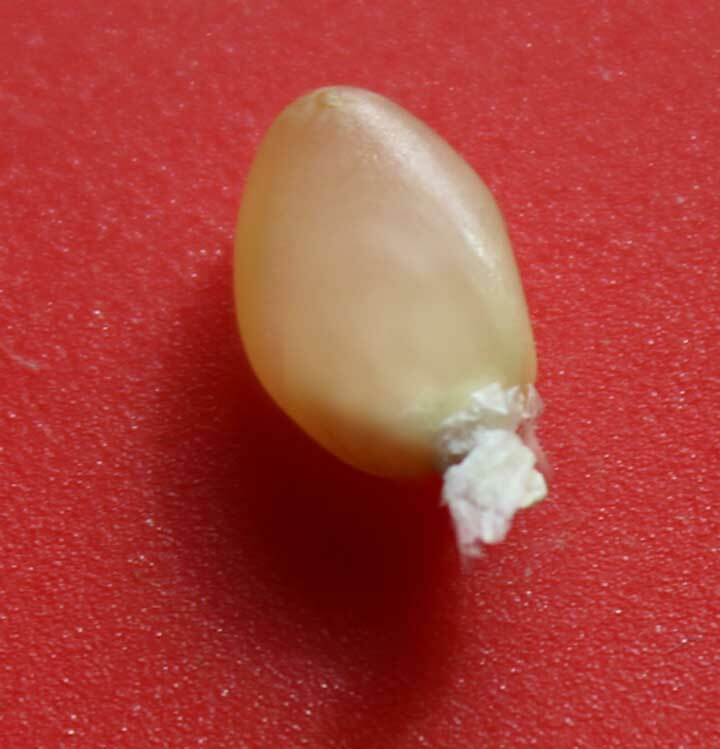 In the above picture you can clearly see the white projection at the base of the kernel. That's what we call the bee's wing. 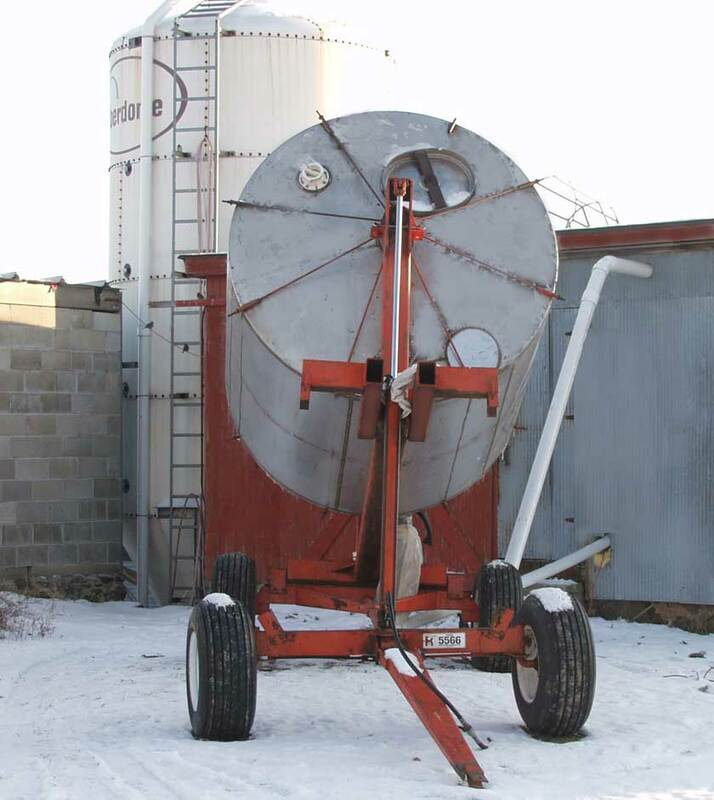 Here the tumbler is in the upright position and is connected to an auger in the white horizontal pipe. It needs to be upright when unloading as gravity is the power that moves the popcorn into the auger. 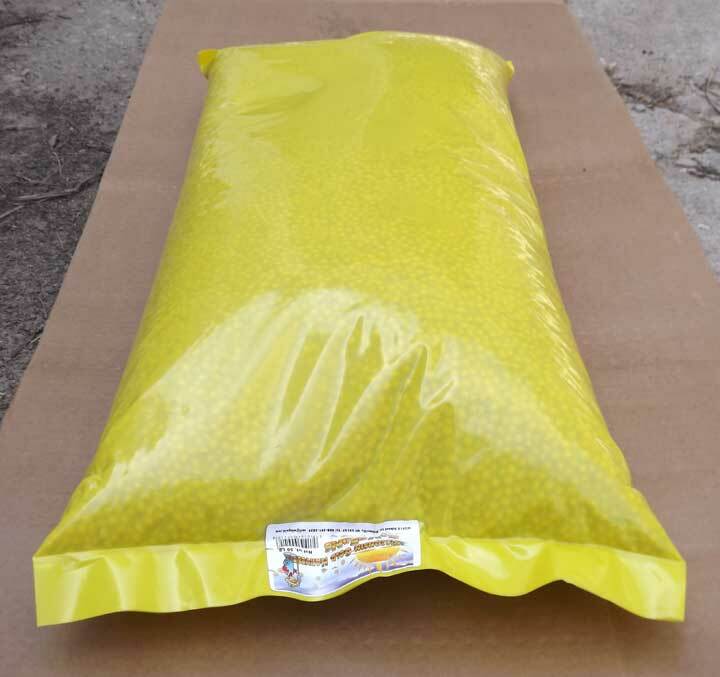 This picture was taken in the winter, although we tumble, clean and package our popcorn all year round. Our tumbler is like a big, stainless steel soup can. A motor and gear box turn it around and around slowly with the popcorn inside. After the popcorn has tumbled long enough for the kernels to remove each other's bees wings, we hook it up to an auger moving the tumbled popcorn into the cleaning room. You can the see the white pipe with the auger in it in the lower right of the picture. The tumbler has an exit pipe on the bottom of the back side.The upper white pipe is there only for pneumatic transfer of soybeans. 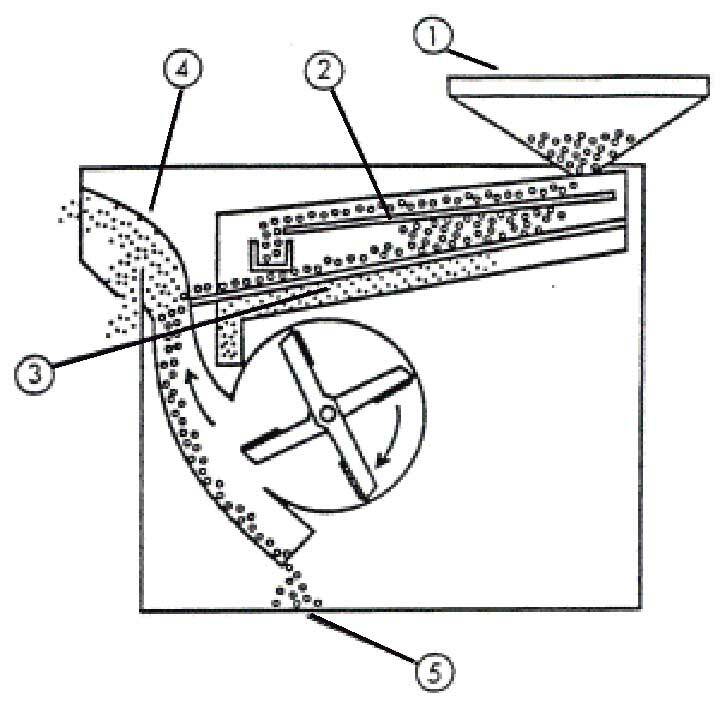 The diagram above shows a side view of a Cipper type grain cleaner. All grain cleaners have similar workings including ours, which is a Clipper Cleaner. The technolgoy stems from cleaners built a hundred years ago. Instead of wood, nowadays they are metal. (1) Refers to the hopper which is basically a small surge bin. It receives the product and keeps an even flow and also distributes the product across the width which is important for even cleaning. (2) Is the "over" screen which means that anything larger than the holes in the screen will get directed out of the machine, letting product drop through unto (3). This is the "under" screen, where anything smaller than the screen will drop away, the product being larger will be directed downwards into an air stream where (4) any light small material will get blown out. (5) Shows the product dropping down into a exit chute. This chute connects to a lower floor where the packaging machine is located. The product is funneled into an auger in the packaging machine. The product gets weighed and bagged automatically. That's all for now, hope you enjoyed the tour!